We wish you a merry christmas and a happy new year. 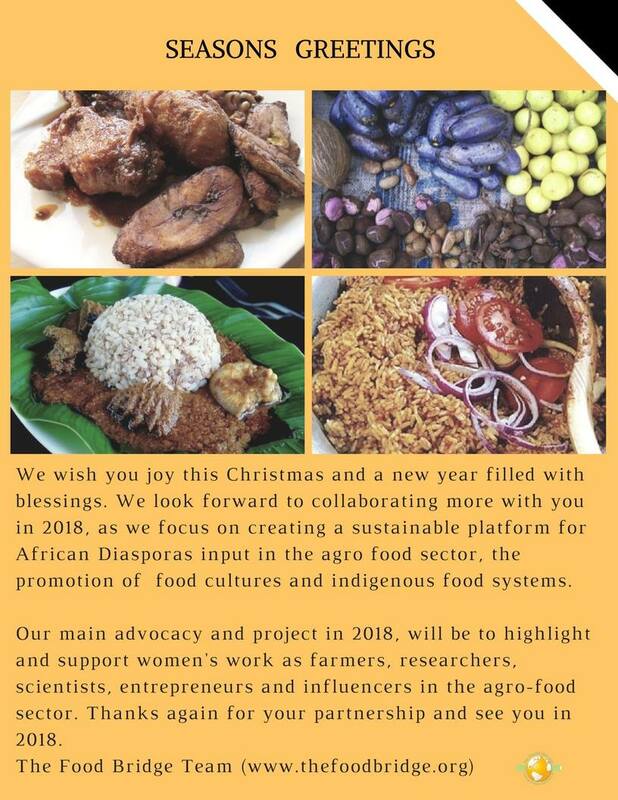 Thanks for all your support in 2017 and we look forward to greater achievements in 2018. The 2017 Africana Flavour which also was the 4th edition of this food festival, held on the 21st of October 2017 at Quatier Malibran Ixelles Brussels. The event was made possible by the support of the Ixelles commune's Dutch section led by Ms Maite Morren. Our partners on the day were the BigPicnic Project of the Botanic Garden Meise, FAAB vzw, Tamneere (Terroir d' Afrique asbl), a non profit organization supporting women farmers in Burkina Faso, Nyemimei Akpee Belgium , a Ghanaian non profit association of the Ga ethnic group who were raising money to renovate a school in their region and Bakushinta, an organization of people of Congolese origin in Belgium. Agasahani a culinary service group, founded by young African Diasporas also gave a cooking demonstration on how to make delicious and healthy 'vérin d’attieké' . As part of the 'faces behind the food' joint project of The Food Bridge vzw and the BigPicnic, participants at this event were also asked to share their favourite food memories.